For a while I’ve noticed that Virtualbox has terrible performance when install Debian / Ubuntu packages. A little top, iotop and atop research later, and it turns out the culprit is the disk I/O, which is just ludicrously slow. The cause is the fact that Virtualbox doesn’t have “Use host IO cache” turned on by default for SATA controllers.Turning that option on gives a massive improvement to speed. 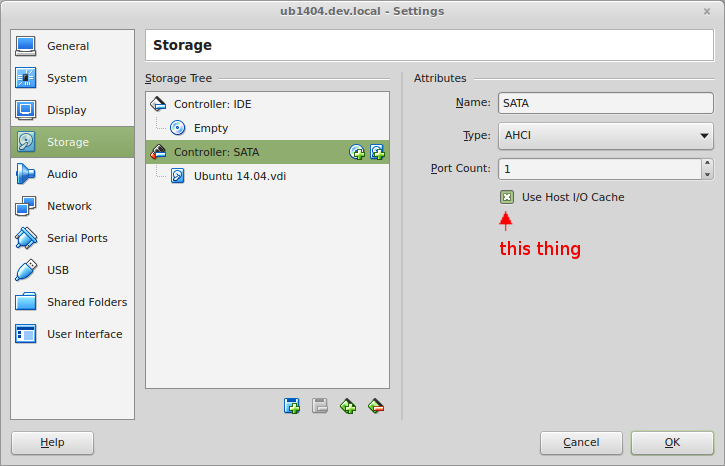 Enable the “Host I/O Cache” setting. You may also want to check any other controllers and / or disks to see if this option is on there. Save the settings and start the VM and you’ll see a big improvement. that the ‘use host i/o cache’ is off by default. basically boils down to safety over performance. I/O errors in the guest as I/O requests time out there. That’s important information to keep in mind. Thanks Craig! For what it’s worth, I already wanted to write the article a few weeks ago, and have been running with all my VirtualBox hosts with Host I/O cache set to “on”, and I haven’t noticed any problems. I haven’t lost any data in databases running on Virtualbox (even though they’ve crashed a few times; or actually I killed them with ctrl-alt-backspace), the host is actually more responsive if VirtualBoxes are under heavy disk load. I do have 16 Gb of memory, which may make the difference. The speedups in the guests is more than worth any other drawbacks though. The gitlab omnibus package now installs in 4 minutes rather than 5+ hours (yes, hours). I’ll keep this blog post updates in case I run into any weird problems. Update: I’ve been running with Host I/O caching on for almost 6 months now. I’ve noticed no performance degradations on the host or other Virtual Machines. I regularly (about 3 times a week) have to hard power-cycle my laptop due to a kernel bug for my Wifi driver. I’ve noticed no data loss in my VMs. Then again, I don’t use them for mission critical applications, nor do they do a lot of write disk I/O. The performance increase on disk I/O in the VM remains extremely high.